After your teen learns the basics in Etiquette, from Etiquette Intermediate, allow them to fine tune their skills with Etiquette Masters. 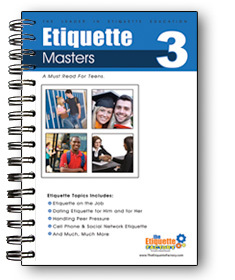 Etiquette Masters gives your teen invaluable insight on etiquette in dating, job hunting, employment and even being a future roommate. This is a short, easy to ready handbook with lasting results. Every teen should read this BEFORE they begin dating, working or going off to college. At the Etiquette Factory, we know that parents have worked hard to instill these qualities in their children. Sometimes, it just really helps when they hear it again from someone besides mom and dad.